Today's color day is inspired in part by Jen's Christmas tree, but really just the holiday season in general. Pine trees are majestic enough to begin with, but add twinkling white lights, delicate gold garland, and glittering ornaments and they transform into fabulously beautiful focal points for any room. 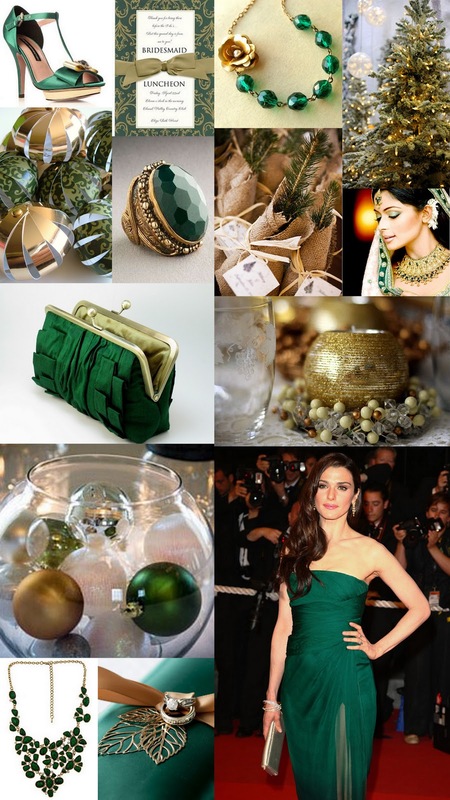 Forest green and gold are rich, warm, and regal colors not just for making a gorgeous Christmas Tree, but also for creating a luxe look for any holiday decor, dinner party, or winter wedding. i'm in love with all of the jewelry on this post. where is it from?? I want to know about the necklace in the top row! Hi Ladies! Thanks for commenting. The necklace in the top row is from Luxe Deluxe on Etsy. The big emerald ring is from Neiman Marcus ($$$) and the necklace on the bottom was found on Polyvore, although we are not quite sure where you can buy it. Ugh. Rachel Weisz always looks amazing.